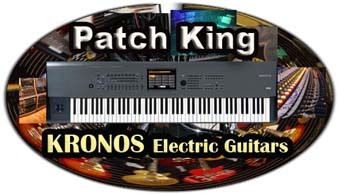 Kid Nepro is proud to announce the release of Volume 6 “Electric Guitars” for Korg Kronos. 32 New Programs – 24 New Combis – 16 New Guitar Loops – 120 Megs New Samples – Only $69. USD. The new sound library includes a wide assortment of the best Electric Guitar samples from our friends at Big Ball Music. Everything from our 1957 Vintage Guitar to our brand new custom Electric AX, these new sounds will have you jamming all day and night. Sounds include clean guitars and harmonics for that light rock or funk track that you’ve been working on, or full blown distorted or overdrive power leads and feedback that are perfect for hard rock or metal tracks. SPECIAL: Korg Kronos SOUND BUNDLE PACK: Get all six of our incredible Kronos sound sets for only $279. Get the complete package of Vintage Synths, Soundtrack Mix, Hit Factory, Sonix Bliss, Dark Energy & Electric Guitars for the special low price of $279. USD – A $66. savings. This set rocks! More info and demos “OVER HERE”! !